One day last August viewers in Salmon Arm, B.C., stared in surprise at the local news. The usual pronouncements of doom were superseded by a positive story. A farmer from nearby Enderby announced that he and his son were trucking their extra hay to drought stricken farmers in Alberta. He asked anyone with hay to spare to join them. This compassionate Enderby man was among thousands of Canadians nation-wide who responded personally to the plight of Western farmers this year. For generations rural residents relied on neighbours for aid and support in times of crisis. In 2002 those traditional bonds of friendship and neighbourliness extended across the entire country in a display of genuine concern guaranteed to squelch the most cynical. When asked "Who is your neighbour?" Canadians from coast to coast answered, "Whoever is in need." In 2002 Western Canada experienced the worst drought in 133 years. 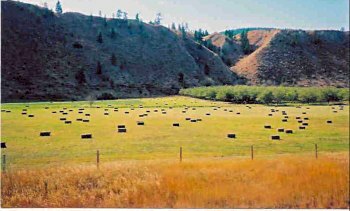 Hay and grain crops were reduced throughout 75% of Alberta. I n some places yields went from an average of 15 bushels per acre to zero. In Saskatchewan there was a 70% drop in farm income from 2001. What little forage survived was eaten by swarms of grasshoppers. Three million cattle as well as horses, buffalo and wildlife faced starvation. People who'd farmed or ranched for generations were left with no crops nor feed for their animals. They had the grim choice of selling their stock at meagre prices or watching them starve. All they'd worked for would be gone. It's been called a disaster of truly Biblical proportions. Desperate owners did all they could. Elaine Boon, of Killam, AB., cut grass from roadside ditches to feed her 17 Arabians which, having eaten all the grass in the pastures, had begun devouring bark and small trees. Finally she offered to give her pure bred horses away rather than have them slaughtered or starve. Her story and those of hundreds of other suffering farmers did what no amount of federal unity programs has done; it brought Canadians together in a deeply caring way. Ironically, in Eastern Canada 2002 hay crops were triple the normal. As the extent of Western drought became known across the country, "It seemed natural," said Eve Yantha from Renfrew County, Ontario, "to send the surplus to those in the West." Some people wanted to see for themselves. Pat Dowling, a hay farmer from Kingston, Ontario, had watched scenes of the drought on T.V. He, his uncle, and Jim Macdonald, the County Reeve, drove non-stop to Edmonton for a first hand look. For two days they visited people in the cattle industry and observed the bleak landscape. "The hardest thing for us," said Dowling, "was, we didn't want to leave. It maybe a big country, but we're all neighbours." Curtis Henkelman of Leduc, AB, whose interview on TV had moved Dowling to investigate, agreed. " Talking to them, there's no difference between us and them. I thought you'd see differences between East and West. Not even close." It was obvious that a major effort was needed. Farmers asked both national railways to donate box cars to ship Eastern hay to Westerners. Both CNR and CPR agreed, donating 200 cars. Adrian Wyands from Smith Falls, Ontario, the staging point for shipment of thousands of tons of feed from Eastern Ontario and Western Quebec to Alberta and Saskatchewan, said he was just returning a favour. During the terrible ice storm of 1998 he might have lost his entire dairy herd when the power was out for more than a week. Power lines were down, barns un-heated, cows going unmilked. Farmers from Western Canada sent generators and emergency supplies to help him and other Eastern farmers keep their operations running. People recalled that during the Winnipeg flood, volunteers from across Canada travelled to the Prairie city to help. Some took their holidays from work to fill sandbags, shore up dikes and comfort flood victims. "This is the Canadian way." Stated Weiebe Dykstra, a New Brunswick farmer helping co-ordinate hay shipments from New Brunswick and PEI. As the farmer's need and overwhelming public response grew more groups and individuals became involved. Hay West was set up to organize shipments and distribution. Alliance MPs Kevin Sorensen from Alberta and Howard Hillstrom worked diligently to promote the effort. The CBC held a phone in show so ranchers and donors could contact each other. The Alberta government gave $200,000 towards bailing Eastern hay for Alberta farmers. The federal government paid for the use of additional rail cars, fumigation and handling costs. The Alberta 4H Foundation and the Saskatchewan Cattle Feeders Association were involved in unloading hay. All this made a great difference. "Say Hay" concerts in Calgary and Edmonton hoped to raise $l million for Hay West. A concert in Kamloops, B.C. organized by regional western poets and singers ,most of whom are themselves working cowboys, was so well attended by local ranchers that it raised $3,000.00. Individual efforts , which were the catalyst to action, increased. In Fort St. John, B.C., rancher Ray L'Hereux put up posters asking for donations of hay. Elaine Boon's Arabians had many offers of help; everything from donations of hay to fostering the horses as long as necessary. One person was prepared to come from Vancouver Island to truck the horses back with him. The Mitchell Centre of Equine Rescue in Vulcan, AB, received more than 80 calls, from as far away as Nanaimo and Halifax. Public pleas from animal owners were answered by people provinces away volunteering to transport hungry horses and pasture one or a whole herd. One person offered an 80 acre pasture. 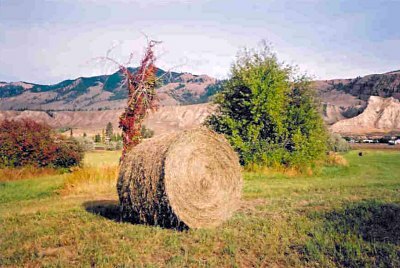 Hay became a symbol of compassion for others, of genuine, unselfish giving. No one muttered that he'd already donated at the office, or asked if there'd be a tax receipt. People gave thinking only of helping others, expecting nothing in return but the knowledge that they'd done as much as they could. No strings were attached, no weighed good will by the ton. A few bales of hay were as welcome as a truck load. Eve Yantha rode the hay train west to meet the farmers who'd get her 34 bales of hay. Regional differences disappeared. Urban Canadians began to appreciate the importance of agriculture. Farmers and ranchers throughout the country gave generously to help those who, like themselves, work year round raising food. People united to save not just the business of agriculture but a cherished way of life. In a speech at Smith Falls Prime Minister Chretien summed up this spirit of giving. It was, he said. " Farmer to farmer, family to family, community to community, Canadian to Canadian. "